← Oh Fancy it; let there be light! About a year ago I bought a book. I brought it home and squeezed it between two others in one of our overflowing bookcases, which are the bane of my asthmatic husband’s existence, as his greatest grievance is that we will one day find ourselves inanimate because he will have suffocated from all the dust the paper collects and I will have drowned in the books themselves. Suffice it to say, we own quite a few books I have not yet read, and also that there are many of them to choose from, which is tricky– because there are many of them and, well, which do I choose? Time is a factor, of course. 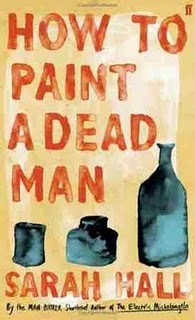 The book in question, however, is titled “How to Paint a Dead Man.” The reason I hadn’t read it yet is that, up until early this morning, my answer was always, “Precisely the same way you would a living one.” This morning I glanced at it accidentally and found that I am no longer as certain of my answer as I was yesterday. Cover designs are either to my taste or not– they do not play a role in any of my decision-making. Titles, however, well, let’s just say there’s a very good chance that I’ve let masterpieces pass me by because their titles did not engage me in a dialogue which I found worthwhile to pursue. I’m only on page 15, but I believe I may have just salvaged one. Read an excerpt here. If you’d like to join me in reading this book, you may venture in this direction. Or you can stop in, find me, (watch me rejoice,) and pick up a copy right away. Did I mention that I’m only on page 15? This one is on my list. It was on the Booker Prize long list (if I’m not mistaken). I usually do well with all of the Booker Prize books. You are not mistaken. Now I’m on page 26. Still good!